You are here: Home / Dogs / Quiet, Please, I’m Reading. I Mean Sleeping. That’s our elderly deaf girl, Mopsy (aka Esther), trying her best to absorb as much knowledge as possible while sleeping. (She says it’s easier than having to read.) Alayne took this photo last week, and it’s just one of many times we’ve found Mopsy in unusual — and to our way of of thinking, less than comfortable — sleeping spots. 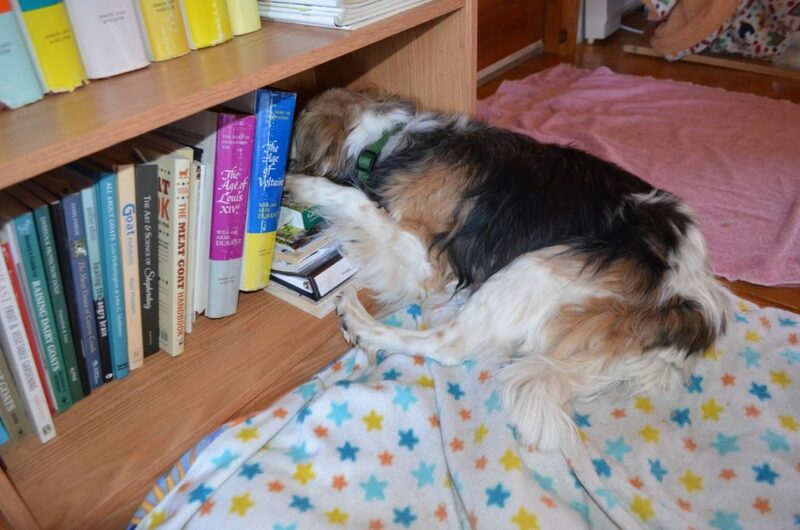 In fact, Alayne has come across Mopsy sound asleep on that book shelf before. She was sleeping so soundly that Alayne was able to lift her head up, put a small fleece blanket underneath her as a pillow, then lower her head back down on it — and Mopsy never woke up. Now that, ladies and gentlemen, is a deep sleep! Ahhhh…what a precious smart girl! I wish I could sleep that soundly! Mopsy is increasing IQ points by some sort of osmosis she has personally researched. Mopsy could give sleep lessons – – plenty of insomniacs would shower her with treats if she could teach them to sleep the way she does. But I think no one would look as cute as Mopsy looks. That’s so cute! What a sweetie. 🙂 Looks like she’s absorbing some Voltaire. Mopsy just knows how safe and how loved she is. Absorbing the words is easier. It’s hard to turn the pages when you don’t have thumbs!